Rick and Georgianne Jackofsky have been making beautiful music together since their high school sweetheart days. They have also been the "Grown" portion of their family band, The Homegrown String Band™, since 1997. Now, as their daughters Erica and Annalee spend more and more time away from home, the intrepid couple finds themselves in a position to explore new musical directions. The result of these sonic adventures is Homegrown Two; a duo creating new music while exploring the oral traditions of the 19th and 20th century vernacular music that was enjoyed everywhere from posh Victorian parlors to rough and rowdy labor camps across the rural American countryside. A Homegrown Two™ performance celebrates the spirit of songcatchers and composers from Francis Child and Stephen Foster to Harry Smith and Bob Dylan. Their repertoire of traditional and original material is performed using a variety of acoustic instruments including guitar, banjo, mountain dulcimer, doumbek, jaw harp, and harmonica. 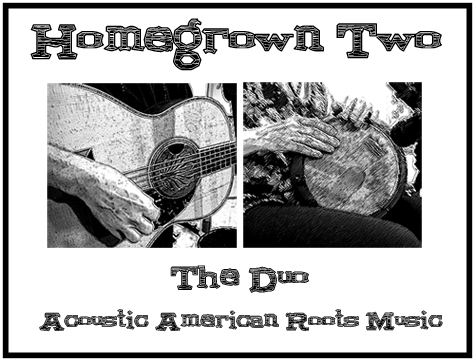 Homegrown Two™ is a great alternative to the full band for more intimate venues like house concerts, coffeehouses, libraries, and acoustic stages at festivals. "Thank you for a wonderful afternoon of traditional folk music. The response cards I received commented that you were our best concert"